Portable hearing amplifier. When there's background chatter or other types of noise, it's difficult to hear the voice that matters. Now you can get instant super hearing with Atomic Beam Magic Ear, the personal sound booster. Go from a noisy environment to a noise-free environment! Unlike other personal hearing devices, Magic Ear picks up sounds from over 100-feet away. Easily hear voices up front from the back seat of the car. Hate going to the movie theater because of all that background chatter and distracting sounds? Magic Ear amplifies voices while cancelling out background noise. 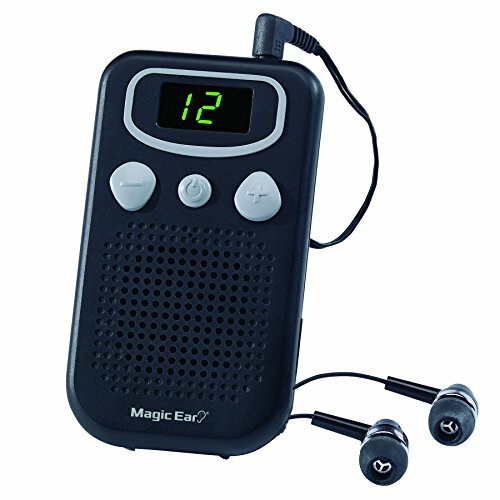 If you're a sportsman, hiker, or birdwatcher, Magic Ear is a must. The hearing device picks up sounds a normal, healthy ear wouldn't. Includes one (1) Atomic Beam Magic Ear. Requires 2 AAA batteries, not included. When words are unclear, you need Magic Ear by Atomic Beam. SUPER-HEARING DEVICE - audio amplifier instantly and discreetly gives you super hearing so you can hear a pin drop across the room. CANCELS BACKGROUND NOISE - unlike other personal hearing devices, Magic Ear hearing amplifier cancels background noise and enhances what matters. PICK UP DIFFERENT SOUNDS - audio amplifier looks like a pocket radio but picks up sounds the normal human ear can't. Great for sportsmen, hikers, and discovering new sounds. HEAR SOUNDS FAR AWAY - unlike a hearing aid, Magic Ear picks up sounds up to 100-feet away. INCLUDED - includes 1 Atomic Beam Magic Ear (requires 2 AAA batteries, not included). If you have any questions about this product by Atomic Beam, contact us by completing and submitting the form below. If you are looking for a specif part number, please include it with your message.